The Mag Lev (magnetic levitation) technology is coming to SE Asia and the proposed routes will be important for property developers and buyers. Whilst most of Asia gets around on planes, and the growing budget fare sector that has revolutionised travel around Asia, trains are making a comeback. High Speed Trains. The Shinkansen (Bullet Train) in Japan was the first to show us that you get from place to place almost as fast on a train as a plane. Train stations were usually mid-city whereas you had to head out of town for an airport, check in, security, boarding, blah, blah. The high-speed train services in Europe like the TGV proved you could be whisked along at 300 kph in safety. But the high cost of establishing the services has been a barrier for many governments to sign the cheques. As of now, China has the largest network of high speed train services in the world with 19,000 of rail laid inside the Asian superpower’s borders. They are now exporting this experience and technology to the southern neighbours. 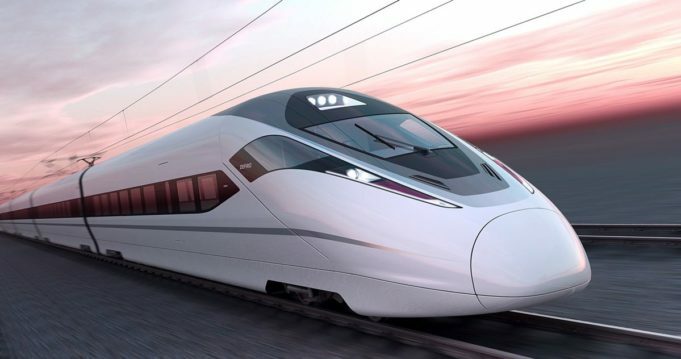 The much-discussed high speed rail service partnership from southern China to Thailand has been scuttled, for now, whilst Thailand’s military government focus their attention on domestic issues but you can be sure the services will be back on the table soon. (The Thai PM has since announced that the Thai Government will solely fund a high speed train service from Bangkok to Nakorn Ratchasima, about 400 km south of the Laos border. It’s also looking at similar services from Bangkok heading south to Hua Hin and beyond). As seen in the past, the introduction of high speed rail services and the stations along the way, spurs a lot of real estate activity in those regions. So get out your high speed rail maps and keep an eye on SE Asia’s emerging new hot spots, as defined by new high speed train services.